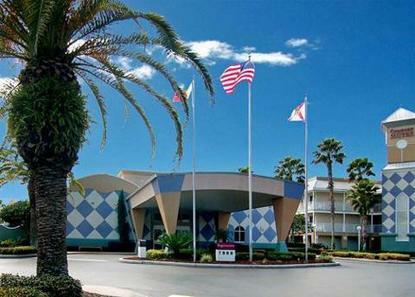 5 TIME GOLD AWARD WINNER: 1999-2003 Located less than 2 miles from Disney, hotel offers FREE scheduled transportation to Disney and Universal Studios, Islands of Adventure, Sea World and Wet 'n Wild. Enjoy excellent dining at our on site restaurant: Carrabbas and walk to supermarket, dining (Red Lobster, Outback Steak House, Subway) and shopping. The hotel is 5 miles from Gaylord Plams Hotel/Convention Center. Benefits include hi-speed wireless internet VPN access, huge outdoor heated pool, huge spa, and kiddie pool, and FREE breakfast each morning All Comfort Suites are smoke free.